Learn about the temperament and personality of the Bedlington Terrier. Discover what he's like to live with, his traits and characteristics and how he generally behaves. And look at lots of Bedlington Terrier photos. The Bedlington Terrier is an adaptable, versatile, affectionate, and entertaining dog. He is determined, inquisitive, opinionated, feisty, and fearless. He has a big heart and will become your shadow following you around everywhere you go. He loves to play, retrieve, jog, and curl up with you when you curl up with a good book. He enjoys just hanging out with you. He is a clownish extrovert and likes to be the center of attention. He will leap for joy when visitors come to your house. He is an energetic, yet gentle, playmate for children. He loves all people, but he especially loves children (though no Terrier will put up with being teased by one). He is usually very quiet unless something gets his goat and then the terrier in him takes over. While he can be a bit headstrong, he is also eager to please. But he is only moderately easy to train. Bedlingtons usually get along with other dogs, but if challenged they will fight. He has a high prey drive and will chase furry animals, and he is fast, so he is safest kept on lead or in a fenced-in area. But be careful, because Bedlington Terriers are very enthusiastic and talented diggers! The Bedlington Terrier is moderately easy to train. He learns new commands at the average rate. He is neither difficult nor easy to train. 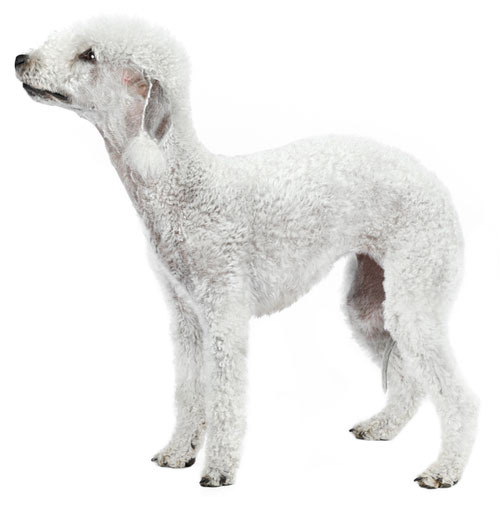 The Bedlington Terrier sheds practically no hair at all. You'll virtually never find a hair in your home!